A novel system of LED packaging employs primary optics that handle light extraction, beam projection, and color mixing in an elegant way. Figure 1. Spherical lens and diffusing mirror over LEDs. The mirror can be produced on one face of the spherical lens by hollowing, roughening, and silvering an appropriate area. Granted, this is academic research, simulation, and prototyping, not applied commercial LED research or production. But the design is so simple and elegant that I imagine many LED packagers will want to experiment with it. 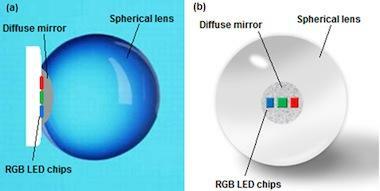 What researchers Ivan Moreno and colleagues describe is an arrangement of three colored LEDS (red, green, and blue) with a diffusing mirror and a transparent sphere mounted over them (figure 1). What results is a tightly collimated beam of light consisting of a mixture of the output of the source LEDs. Almost all of the light is extracted after multiple passes of total internal reflection. "Optical performance is good," the researchers report. "The optical efficiency is [about] 80 percent, color uniformity is good, and the beam directionality is high." This approach to color mixing avoids the color separation, inhomogeneities, and beam spreading that can result from secondary optics in existing LED spotlight designs. Figure 2. (a) A few exiting rays simulated, showing multiple passes of total internal reflection. (b) Narrow exiting light cone simulated. Figure 2 shows a simulation of the near-collimated output emerging in a narrow cone from the spherical lens. 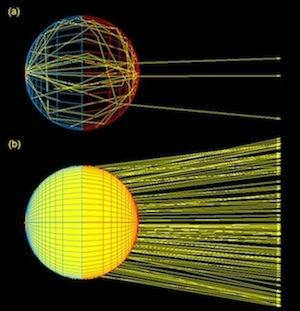 Light leaving the LEDs at other angles undergoes total internal reflection (TIR) with very little loss of energy from an inside face of the sphere. All such light that eventually encounters the diffusing mirror is reflected at a random angle and either escapes or participates in more rounds of TIR. The multiple passes of TIR mix the light from the three source LEDs. The researchers point out that the multifunction LED packaging technique could provide valuable flexibility in the design of color-tunable spotlights for applications such as downlighting and floodlight, show, entertainment, and architectural lighting. The desired characteristics might be obtained simply by siting the required number of LED packages. Secondary optics for collimating or focusing might be dispensed with entirely, saving space and expense. Moreno et al. note that "The disadvantage of the method we have described is color uniformity," but they are working on improving that. The work will be published as I. Moreno, N. Rodriguez, and J.C. Basilio, "Simultaneous color-mixing and collimation within LED package," Proc. SPIE 8841, 2013.
Who has access to software capable of Monte Carlo ray-tracing simulations of such a setup? I would love to explore variations, such as the beam spreads obtainable with an ellipsoidal lens. Place the long axis parallel to or normal to the plane of the LED emitters. My suspicion is that a long-axis-normal ellipsoid lens could produce an even more sharply collimated beam.